Which Jesus is Calling on You? During the hippie era there was a rising interest in spirituality, especially influenced by the Beatles and their adventures in India with mind-altering meditation and drugs. It was a time of the Vietnam War and this gentle-sounding meditative spirituality promised goodwill and harmony on earth. As young people we were told that if we could hear what the spiritual world was trying to tell us, listen quietly and meditate, we could tap into this same blissful message. By submerging our selves into an altered state of ethereal bliss we could find our path in life, and continue our spiritual journey to wholeness. Personal peace was a sure gateway to global peace we were promised. 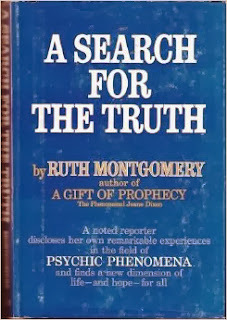 My spiritual journey began in 1968 with automatic writing, based on a method taught by spiritualist Ruth Montgomery. I would sit with pen in hand with a blank sheet of paper and meditate, calling on the voices of the spiritual world to come and speak to me. I was very earnest about this and wanted a soothing word that would portend my future. Night after night I would sit and expectantly wait. Montgomery said that this automatic writing was a way for the spirit world to communicate important messages. What is automatic writing? Scripts produced without the control of the conscious self. It is the most common form of mediumship... one of the most valuable spiritual gifts as... it opens up a direct channel for obtaining teaching from the Beyond. Over the next few years I would try other similar meditative practices in order to transcend the spiritual emptiness in my life. I was looking for a comforting word of hope for my future, and a glimmer of peace for a world that loomed on the horizon, dark and scary. And for awhile there was a light. It was beckoning and intoxicating, and it produced powerful feelings of peace and love. I basked in its radiance for many days. But one day abruptly it came to an end when a cascading series of bad things happened in my life. What had happened? I had done everything right! But when that light withdrew I was immediately thrown into a terrifying darkness. I desperately kept trying to re-discover that bright light but it was ever elusive. One day a fellow high school student, listening to me talk of my spiritual search, taught me how to do a centering prayer. His version came straight out of an occult handbook. He read aloud the steps. The book said to envision myself going down, down, down into myself to a deeper level of meditation than I had previously experienced. And then at the very depth of this "center" I was to call out "enter" to invite a more potent spirituality in. Fast-forward to the early 1980s. 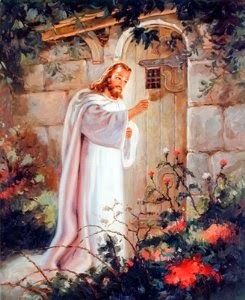 I was a fairly new believer in Jesus Christ. We were attending a charismatic church that held an ongoing prayer vigil. Off to the side of the sanctuary was a prayer chapel where we were encouraged to dedicate an hour each week. I happily settled on an early Saturday morning time for prayer. The first time I entered the cool, quiet, dimly lit chapel, I felt an overwhelming sense of peace and serenity. The woman who was finishing up her prayer time slowly lifted her head and rose to greet me with a loving embrace. As I took her place in the short pew, she placed a spiral notebook in front of me. It was filled with page after page of messages from God. She explained that everyone who went into the chapel was to sit still, and wait, and listen to "the Lord" speak to us. We were then to record what he said. I scanned the messages and they all seemed encouraging, edifying, consoling and promising. Many paragraphs were filled with uplifting phrases that sounded biblical. Recognizing this technique, I was a bit startled. I asked her nervously, "Isn't this the same as automatic writing?" "Not at all!" she rushed to assure me. She said that as a new believer I could practice this same meditative art, but this time it would be the Holy Spirit who would talk to me - talk through me - and that in this way He would speak words to others in the church. Since she was an older woman in the Lord and seemed to have much faith, I took her word for it and sat down to meditate and listen to Jesus. Pretty soon words came into my mind. They were shocking! The message I heard was not encouraging at all! It didn't match anything else anyone had written down. Instead the message I received was pure Scripture: "Repent!" it said over and over again, based on various verses from Scripture about repentance. I struggled with what to do. Should I tear up what I had just recorded? But I noticed that it was Scripture, so I finally decided to just leave it there on the page. I walked out of the chapel into the chilly morning air a bit disconcerted. What had just happened? Hadn't I prayed and asked Jesus for a message? Why didn't my message match the other beautiful and positive words that were on the pages of that notebook? I wondered if anyone else in the church ever got such "negative" messages. I wondered if the message was real. Was Jesus really calling the people in the church to repent? Was there indeed sin in people's lives? All week long I was troubled. Maybe it had just been a word meant for me. I examined my own life over and over again and repented of every single thing that I could think to confess. I went back the following Saturday morning and expectantly awaited again. This time when I closed my eyes to pray, I heard a new word. It said: "Is not this the fast that I have chosen? to loose the bands of wickedness, to undo the heavy burdens, and to let the oppressed go free, and that ye break every yoke? Is it not to deal thy bread to the hungry, and that thou bring the poor that are cast out to thy house? when thou seest the naked, that thou cover him; and that thou hide not thyself from thine own flesh?" These were verses from Isaiah 58:6-7. Again I was upset. Why were the words I received so different from the others? The church had just embarked on a fasting program and great victory in Jesus had been promised. Many hoped that "strongholds" in their life would be "broken" so that they could finally become wealthy. Nobody was talking about giving to the poor. They were only "believing" to get rich themselves. Was this why this verse came to my mind? I hesitantly wrote it down in the book. For the next few months I went back to the prayer chapel every Saturday morning where I consistently heard similar messages based on Bible verses that spoke about the need to repent. I was becoming very confused. One day soon after this another older woman in the church phoned me. She was becoming quite concerned. Dave Hunt and T.A. McMahon had just issued their groundbreaking book The Seduction of Christianity and she recognized that our church was getting involved with all sorts of spiritual practices that Hunt was warning about. Then one Sunday morning service the assistant minister asked us to close our eyes and envision Jesus taking us on a journey to new see spiritual insights and hear new words. Guided imagery. Visualization. Centering. The same sorts of things I had done as a hippie. Only now we were being told that it was okay because it was "Jesus" leading us. This church's leaders soon began to formally teach that in order to contact Jesus we needed to learn to practice these meditative arts. We were told that some members were reaching a higher, more elite form of spirituality by approaching Jesus through these methods. But what about our simple humble prayers and supplications? What about His shed blood on the Cross? The new way to reach Jesus was through our own spiritual journeys and these mystical endeavors. It promised an easier way. Nobody had to change anything about their lives, or repent of any of their evil deeds. The Gospel of Redemption was missing from these teachings. And I noticed that it was all very selfish. "Centering" always seems to result in self-centeredness. Shortly after this episode, a group of us left the church. We formed a Bible study, and like the Bereans we began to study the Word to learn more about what had just happened to us. We also read Constance Cumbey's The Hidden Dangers of the Rainbow and all the new books that Dave Hunt was writing. Our Bible study would last for over fifteen years. Fast-forward to the early 1990s. I continued researching the New Age movement, especially to understand more clearly the type of eastern mysticism that I had become entangled in as a teenager. One day I received a phone call from a man identifying himself as Warren Smith. He said he had been put in touch with me by a mutual friend. Warren told me that he was a former New Ager who had been born again. He had just spent the past few years of his life traveling the country to spread the word about a book he wrote, his testimony called The Light That Was Dark. I immediately understood his book title - I had also experienced the light that turned out to be dark! Warren told me that he was becoming concerned. Almost unbelievably he was seeing these same New Age practices coming into the church. I shared a few of my prior experiences with him. We had much in common, including our mutual fears that leaders in the evangelical church were starting to take the old familiar (to us) New Age mystical concepts and dress them up in new theological garb. These leaders were promising deeper levels of new spiritual truths by performing these same old mystical methods. Warren and I both knew it to be a spiritual fraud. We worried it would only only lead people into darkness and deception. The "new gospel" teaches that when humanity collectively accepts and experiences itself as being a part of Christ and a part of God, we not only save ourselves, we save our world. The "Christ" of the "new gospel" warns that the hour is late. Peace must come. He will help. He has a plan. But everyone must play their part. When we were new believers both Warren and I never dreamed that these same old teachings would come into the evangelical church world and be believed! But they did. And they came in via the same old mystical methods we had once learned from the occult. Fast-forward to the present. 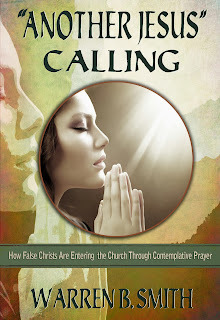 Warren Smith has just published a new book "Another Jesus" Calling: How False Christs Are Entering the Church Through Contemplative Prayer (Lighthouse Trails, 2013). In this book Smith analyzes the "God" of God Calling (2005) and the "Jesus" of Sarah Young's book Jesus Calling. Both this "God" and this "Jesus" have remarkably similar messages. Both deliver messages nearly identical to that of the New Age false "Christ." Both are calling believers to engage in a new (old) spirituality. The "God" of God Calling and the "Jesus" of Jesus Calling both call upon people by delivering new words. Their words were transmitted, written down, and then published. The same method! The word "Presence" is found more that 365 times in Jesus Calling. The term is also commonly used in the New Age/New Spirituality. And in both God Calling and Jesus Calling, "Jesus" states that experiencing his presence will unlock secret teachings, new revelations, and future things to come." Why do Christians believe they should to practice the "presence" of Jesus? Because it promises them increased intimacy with God, thus bypassing the Cross. It does seem to fill a spiritual void and/or an emotional need. And it is an easy device. Under these new teachings believers no longer need to trouble themselves about confessing besetting sins in their lives. Instead this new voice of "Jesus" speaks rosy promises of guidance and transformation, even wealth and power. This "Jesus" even promises co-creative power, the ability to transform the world by our meditative attitudes. By concentrating on the words "be still" believers learn that we can even become God. Smith's critiques all of this in a brief well-laid-out 174-page book. This is Warren Smith at his best - his easy folksy style renders hard concepts accessible and understandable. Each chapter is very brief and to the point. Smith raises Ten Concerns about the original book God Calling, which entered the Christian world in 2005, and Twenty Concerns about Sarah Young's Jesus Calling, which has more recently taken the evangelical world by storm. Is Jesus indeed speaking a new word to us today? Or is this the voice of "another Jesus" who is calling upon the world to laugh at the future? Smith's analyses are insightful. Sarah Young's "Jesus" encourages believers to gain more spirituality through creative visualization. This "Jesus" flatters her readers with florid speeches such as "Let My gold-tinged Love wash over you and soak into the depths of your being" and "When your Joy in Me meet My Joy in you, there are fireworks of heavenly ecstasy." This same passionate "Jesus" is rapidly gaining traction elsewhere in the evangelical world. He offers spiritual experiences that are addictive and mind-altering, but not based on the truth taught in God's Word the Bible. He promises intimacy without repentance, spirituality without salvation, and communion without regeneration. Nevertheless many believe these new words. Why? Double Check Yourself. Many readers will have questions and qualms when they first encounter Warren Smith's book. If you have already read God Calling or Jesus Calling, you may be persuaded that you have seen the light, that you are soaking in the presence of Jesus, that you are gleaning new words and gaining great intimacy with the Lord. You may even feel that you are on a marvelous light-filled spiritual path that is ever-winding deeper into the mysteries of God. You may be experiencing all sorts of uplifting and marvelous things. But is this true? Or is it a mirage? Stop before you go any further on this spiritual journey. You need to find out where this journey originated and where it is headed. Read Smith's book and "contemplate" the simple questions that he raises. Are you sure you are hearing the right Jesus? Are you certain you are following the biblical Jesus? Maybe you should double-check. There is a lot at stake. The presence that came calling on Sarah Young is extending an invitation to the readers of Jesus Calling to experience his presence as well--an invitation that is depicted in the book cover's inviting hand. Keep in mind that another invitation is also taking place. If we choose to sit "with pen in hand" waiting to hear "more" than God's inspired Holy Word, we, too, have an inviting hand. But what presence are we actually inviting into our lives? If one becomes dependent on a subjective presence rather than the objective Holy Bible, deception is inevitable. 2. Nothing happened! I am utterly convinced that it was God's grace and mercy, which is beyond my comprehension. How else could I not be overtaken by demons at this juncture in my life when I so boldly opened myself to them? 3. Leslie A. Shepard, Encyclopedia of Occultism & Parapsychology (Vol. 1, A-L) (Gale Research Co., 1978), p. 79. 4. Sadly this young man had already encountered a "spirit guide" named "Ulrich." Again, I am profoundly thankful to God for His hand of protection. Nothing happened to me when I tried this technique. 5. My husband Lynn and I will be forever grateful to the wise godly counsel of our next minister, the Rev. Bob Cutbirth, who tenderly and tediously explained the truth to us, and helped us to untangle ourselves from all of the error we had just encountered. 6. Warren Smith's original 1992 book of this title was republished in 2005 by Mountain Stream Press, with a new subtitle: The Light That Was Dark: From the New Age to Amazing Grace. 7. Warren Smith, Reinventing Jesus Christ: The New Gospel (Conscience Press, 2002), Preface, p. 6. This book has been republished as False Christ Coming: Does Anybody Care? (Mountain Stream Press, 2011). 8. Warren B. Smith, "Another Jesus" Calling: How False Christs Are Entering the Church Through Contemplative Prayer (Lighthouse Trails, 2013). A combination quote from both p. 74 and page 122. 9. Concern number 5 about Jesus Calling is that Young's "Jesus Tells Us to Laugh at the Future," which Smith analyzes on page 62-63 of his book. 10. This quotation is from Sarah Young, Jesus Calling: Enjoying Peace in His Presence (Thomas Nelson, 2004), p. 310. Warren Smith cites it as an example of flattery on page 65 of his book "Another Jesus" Calling. 11. Ibid, p. 239 in Young's book. 12. "Another Jesus" Calling, p. 124. Both Warren Smith and I can personally attest to the dark and occult nature of these mystical practices. There is no other Jesus than Jesus Christ, and His Word is already written for us in the Bible. For those who are truly born again, the Holy Spirit is given. We do not need any other "presence" nor any other "word." Ed. Note: This book "Another Jesus" Calling would make a great Christmas present for everyone on your list this year. To order a copy call (903) 567-6423. Bulk discounts available. Other books by Warren Smith are also available.